Your new fireplace may look fantastic, but safety always comes first. When you search for a fireplace screen that will look good, protect your home from fire damage, and last for years, we are confident you will choose this model. Instead of moving it out of the way to stoke the fire or clean ashes out, you can simply open the doors for easy access. The powdered graphite screen is built with long lasting service in mind, and won't be damaged by smoke or contact with burning wood. 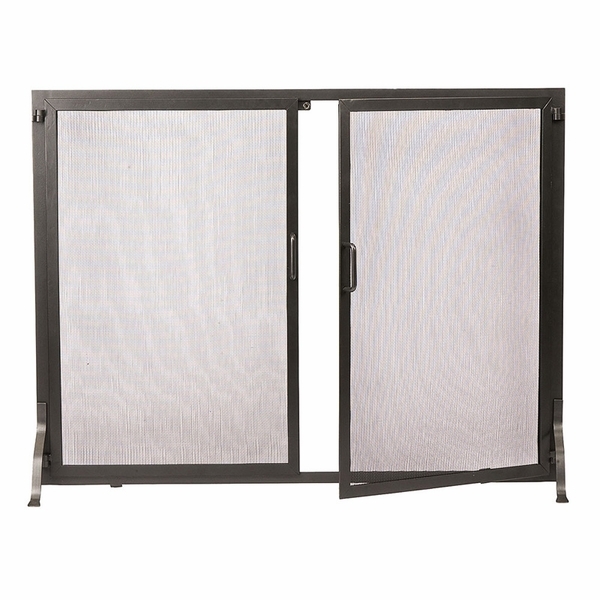 Supporting the screen itself is a wrought iron frame that is as functional as it is elegant. Are there legs on both the front and the rear? If they are, are they located at the ends behind each other? This screen uses forward facing legs at the outside edges and a pair of leveling feet that are set inward a bit further. The inward legs do not project rearward and are simply used to help offset an uneven brick hearth. What are the dimensions of each door? Per the manufacturer, each door assembly is approximately 18 inches wide by 28 inches tall. Are the legs removable on this screen? Is the dimension of 38" x 30" the size of the frame, or are the legs included in the height? The legs are indeed removable for ease of shipping and storage. The overall height does indeed include the legs which elevate the screen just slightly.